To make the mayonnaise, mix together all the ingredients. To cook the fishcakes, pre-heat oven to 200°C. - Remove product from packaging. 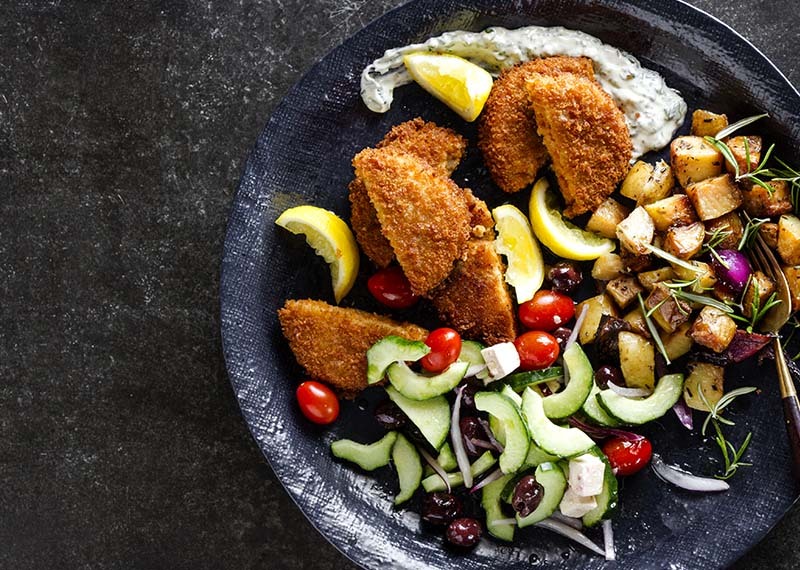 - Place fish cakes on a rack on a preheated baking tray and bake for 15-20 minutes. - Allow to cool slightly and serve . To make the dressing, mix together all the ingredients. Mix well and season. For the candied walnuts, place the walnuts, sugar and water in a bowl and toss to coat. Heat a large non-stick frying pan over a medium heat and add the walnuts. Cook them for 6 – 8 minutes, stirring occasionally, or until caramelised. Set aside to cool. To heat the tart, preheat oven to 160'C Remove sleeve and lid. Place on a baking tray in the centre of the oven and bake for 8-10 minutes. Scatter the walnuts over the milk tart and serve with fresh cream and seasonal berries.